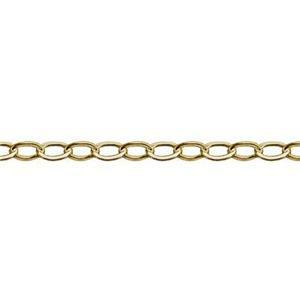 Our bestselling gold filled cable chain for years! We’ve definitely got you where you want to be with this 1.6mm bulk flat cable chain. Perfect for layering or simple pendant necklaces. Finish with our complete selection of gold filled jump rings. No weak links here. Gold-filled is a wonderful alternative to solid gold. It lasts a lifetime and is a fraction of the price. This sparkly little chain is made from flattened links that catch the light at every turn. The 1.6mm diameter is lightweight and easy to wear. The delicate chain works well with small to medium charms or pendants to create golden glimmering jewelry accessories. Looking for the perfect Jump Ring for this chain? Try GJ33 to finish any custom length you choose. Or, check out our ready-to-wear finished necklace lengths of this same chain style in the finished chain section. First time order - much nicer than pic. Small, dainty, perfect lightweight chain for making delicate necklaces. Will definitely purchase again. I use this chain for almost everything. I love the look and shine. I use it as it is most cost effective but I find myself replacing many chains for customers as they snap/break easy. It doesn't reflect well on my product. I am looking into finding similar chains that are more durable. ******************Halstead Customer Service response: Hi and thank you for your feedback. We would be happy to help you find a chain that meets your needs. Please contact our customer service department at: 800-528-0535. We appreciate your comments! I have purchased these for years and am overall satisfied with them. About 4-5% have a defective clasp. ************************************ Halstead Customer Service response: Hi Corrin, Thank you for your feedback. Spring rings tend to be stiff at first, but if you open and close them a few times they will loosen up. If you try that and they still won't work properly, please return them to us. You are welcome to return any items you do not find satisfactory within 30 days of purchase. We appreciate your comments. I like this chain very much to add a few adjustable inches onto necklace.